For many years now, universities have been relying on contract appointments for faculty, rather than full-time, permanent positions. The negative effects on faculty, students, and the university community are well-documented. But until now, we have had very little information about the extent of precarious employment among faculty and its implications for bargaining. Universities are understandably reluctant to release information that might make them look bad, and Statistics Canada does not report on contract faculty. In order to learn more, CUPE submitted Freedom of Information requests to all 78 publicly-funded universities in Canada asking for ten years of data on faculty appointments. To-date, we have received usable information from 70 universities. Thanks to this research, we now know that for the past decade, more than half of university faculty appointments in Canada have been contract positions. We also know that the majority of these contract appointments are part-time. 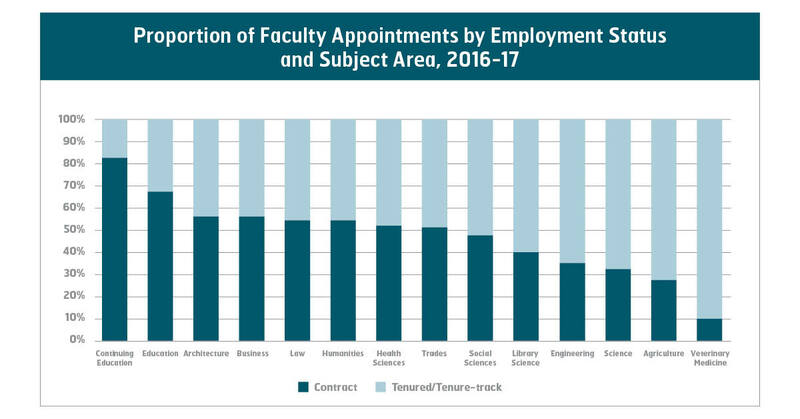 In 2016-17, part-time work accounted for nearly 80 per cent of all faculty contract appointments. Our findings also reveal that Quebec relies on contract faculty appointments far more than any other province. Ontario is also above the national average. Alberta and Prince Edward Island, by contrast, have the lowest rates of contract appointments. When looking at rates of contract appointments by subject area, there are significant differences. Humanities, for instance, depend far more on contract appointments than social science or science. However, in all subject areas (besides agriculture and veterinary medicine), contract jobs represent more than one-third of appointments. While reliance on contract faculty has become a systemic part of higher education across Canada, some universities are worse than others. At twelve universities, contract appointments make up more than two-thirds of all faculty appointments. This suggests that despite the many excuses given by universities, use of contract faculty is really about the choices that institutions make, not about funding cuts or the personal choices of individual faculty members. 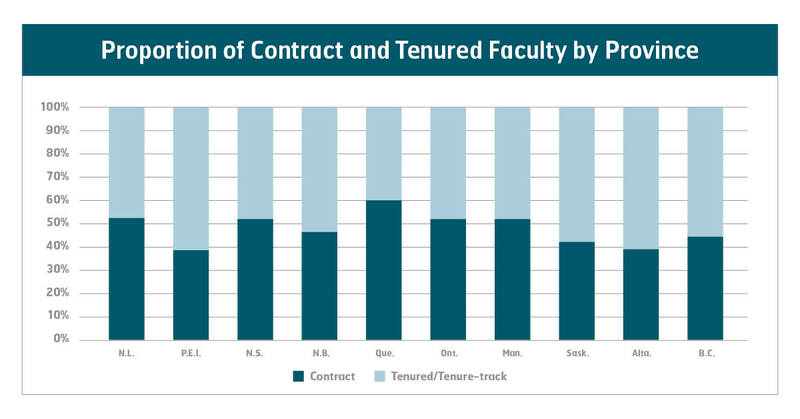 The information at contractu.ca – available to researchers, union organizers, and bargaining committees alike – can help your local identify how rates of contract faculty appointments at your institution compare to other universities across the country. This can help your local refine its bargaining strategy. More information on bargaining to reduce precarity in the sector and to protect precarious workers can also be found in CUPE’s new guide Quality Jobs: Tackling Precarious Work in Post-Secondary Education at the Bargaining Table. Find it on cupe.ca or through your staff representative.